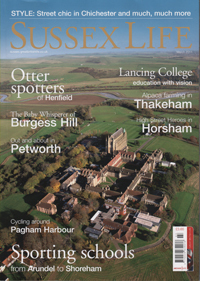 Nicholas Toovey was recently asked by Sussex Life magazine to write a regular feature on contemporary Sussex artists. He was approached because of his contacts within the art world that he has formed from hosting the annual Contemporary Art Auctions at TOOVEY’S. It enables Nicholas to further promote artists and the arts in Sussex, an area he is particularly passionate about. His first article on Brighton-based artist Chris Kettle was published in the March issue of the magazine and is available in the shops now for £3.65.